30 years ago while running in Audubon Park, I watched a very fit man, who looked well educated, walking deliberately barefoot on the soft ground under the oak trees. Day after day, I would see him do the same thing. Now please understand … I was on fire as a young Registered Dietitian Nutritionist trying to learn as much as I could about wellness interventions since I was working with patients who were being treated for cancer and other life challenging diseases. One day while running, I finally stopped and asked him why he was deliberately walking barefoot day after day. He told me he was “earthing” and by connecting his bare feet to Earth’s electrons, it promoted healthy physiological changes. Flash forward into 21st century, emerging Environmental Medicine research(1) is revealing that “earthing” does indeed induce positive physiological changes with benefits ranging from reduced pain, better sleep, significant relief from asthmatic/respiratory conditions, PMS, high blood pressure, lower cortisol production which reduces anxiety, depression and irritability, and less inflammation. How his “ethic of prevention” worked for me. 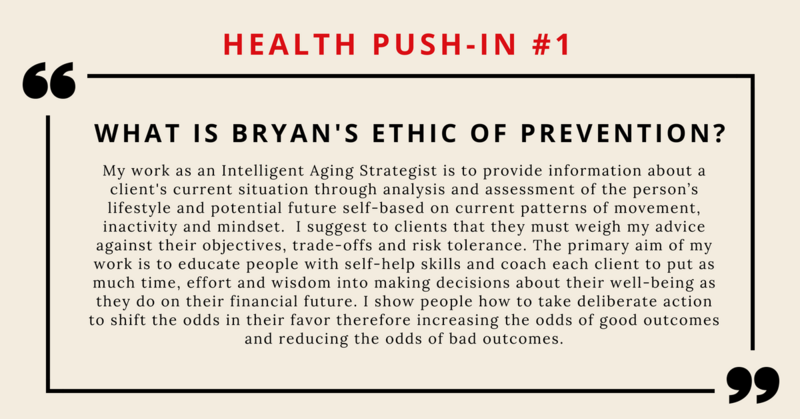 From that point, I have come to know, train and collaborate professionally with Bryan Patrick Agurcia, BA, MA, an Intelligent Aging Strategist. I have never left a conversation with Bryan without changing my behavior in some way to help me overcome a joint or an aging issue. For example, I was having an ongoing unexplained hip issue in which an MRI could not explain. After countless sessions of physical therapy, I was then offered a surgical option with only a 50% possible success rate. No thanks. I was told it’s the wear and tear of age. I turned to Bryan, who asked me very specific questions because he was looking for a lifestyle pattern. First he referred me to someone who is certified in the Barnes myofascial release technique to address the internal issue. He then recommended for me to get a disk pillow and stay mindful of my movement and sitting. What was striking in my recovery is that Bryan factored in my lifestyle and repetitive patterns – not necessarily my age. He shared techniques that I could work on daily. He operated from his experience, knowledge of anatomy and physiology, and his philosophy of “an ethic of prevention”. Yes, it worked! Thank you Bryan for helping me avoid surgery and stay fit. For more on “an ethic of prevention, see Health Push-In #1 below. I’ve got questions, he’s got answers. Last blog, I shared the emerging hormesis hypothesis for preventing and postponing age related condition. Given Bryan’s forward thinking in GeroScience (i.e., the interdisciplinary field that aims to understand the relationship between biology, aging and age-related diseases.) and his life’s work in this field, he agreed to my interview to share some of his wisdom with his hometown. Diana: Bryan, I know you have a background in gerontology, exercise physiology and wellness, but please tell Better Health blog readers about yourself. Bryan: I am formally trained in Exercise Physiology with a Masters in Gerontology from the University of New Orleans. I also trained as a US Marine. I refer to myself as an Intelligent Aging Strategist based on my 30 years of experience within my private practice – Intelligent Aging and Beyond – in Boston, MA. My whole systems’ approach (i.e., cognitive, physical, social, and emotional) to aging provides my clients a platform to understand that there are no boundaries to improving their biology. After Katrina, I relocated with my family from New Orleans to a suburb of Boston. My daughter is now 13 years old and sometimes likes to spend time with her middle-aged father who is obsessed with slowing down the aging process! My main method of transportation is a bicycle. The Marine in me rides in blizzards, rain or sunshine! I spend as much time outside as possible regardless of the weather conditions. I bring this up because most people spend time indoors within a temperature range of 8-10 degrees (65-72 degrees Fahrenheit on average). I spend a good amount of time outside throughout the year in a range of about minus-20 to 100 degrees. The result, which is related to the hormesis theory you wrote about in a previous blog, is that our bodies adapt to small stressors by becoming stronger. I purposely make myself uncomfortable every day. I do this not because I enjoy it, but because I am aware of how to make the body stronger for aging. Diana: Bryan, I love your AgingWell program. It mimics so many features of the Mediterranean lifestyle, yet, your program is infused with the latest of GeroScience research. How do you view aging? Bryan: I was greatly affected by the book “Successful Aging” back in the mid-90s. The thesis was only 40 percent of “aging” as we define it is due to genetics and the rest is within our control (i.e. lifestyle). I am biased toward a future where I thrive and flourish versus the common adage, “I’m old and therefore age equal declines.” I recently read in the GeroScience literature that the “days of decline and disability are gone” and I absolutely subscribe to this based on how I live my own life and those that I work with. I view aging as a process and not one single event that happens at 65 years old. Aging is not a straight path to getting there. What we know from the GeroScience and Genomic research is that our lifestyle can alter our health in such a way that it boggles the imagination. Prevention is by far the better investment economically and practically than treatment of a disease. The REAL SKILL is designing a strategy that maintains what you have while increasing metabolic efficiency, muscle and cognitive function. Diana: So, what are the core strategies that you focus on with the aging process when working with clients? Bryan: The first foundational element I teach is what I call Mindware (1), a term popularized by David Perkins, Ph.D., a speaker, author and consultant to educational groups throughout the world. Mindware is a “tool” of the mind. It is “the strategies, attitudes and habits that extends a person’s power to think critically and creatively.” The gist here is where did we “learn” how we choose to age? My life experience tells me that most people rely on what they have learned either from family, culture, life experience or TV … yet what they know is only a tiny piece of reality. What you believe “normal aging” to be is probably NOT accurate. GeroScience is constantly revising and updating what is possible as we get older. I recommend for people to challenge and update their thinking frequently as this will help you focus on improving your future. Diana: Bryan one of your core foundations is Ideal Food/Fuel. What does that mean? Bryan: I suggest some basics. The human body is about 60% water in muscle tissue and the brain is about 80-90% water. It’s rather simple logic to me. If either of these tissues are dehydrated, we will either not be able to move well (i.e. walk or get up off the ground under our own power) or our cognitive function will be compromised. Studies show that even mild dehydration has been shown to cause cognitive deficits. Also, electrolytes are important: calcium, magnesium, sodium, chloride and potassium. Many of these help the nervous and muscular system function. One can still function if they are in low supply, but it will not be anywhere close to ideal. I encourage my clients to stack their diet with colorful vegetables, similar to what you have been writing about in your Mediterranean blogs. I educate them to incorporate superfoods daily that have a hormetic effect (i.e. organic berries capers, cilantro, cruciferous vegetables, fennel, garlic clove, ginger, lots of herbs and spices, horseradish, leeks, onions, radishes and their green leafy leaves, turmeric, shallots, and turmeric root). Meals should be complemented – not designed around – protein (i.e. wild caught fish, grass fed meat, some grass fed sheep and dairy foods, nuts and seeds). And, the body needs oils. My go-to’s are cold-pressed Extra Virgin Olive Oil and Coconut Oil. The need for small amounts of fermented/probiotic foods with each meal and prebiotic foods to feed your microbiome is also a key feature to keep the aging person’s immune system in better shape. Diana: Fabulous exclamation point on fermented foods and prebiotic foods for healthy aging … Dorignac’s will soon have a fermented corner. 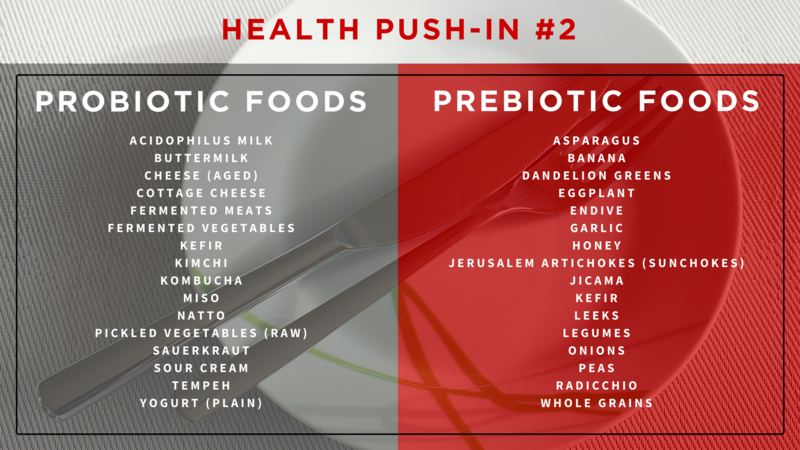 (For a list of popular probiotic and prebiotic foods, see Health Push-In #2 below.) Why do you think the research is showing so many health benefits from the Mediterranean lifestyle? Bryan: Simply because people studied in the Blue Zone research move naturally, eat wisely, have the right outlook and, probably the most important, connectivity and community. I believe the benefits would come to all of us if we could all go back in time about 100 years. We have seen extreme changes in our environment within the last 100 years which is nothing in “gene” time. Some scientists call this the “mismatch theory.” Our bodies are mismatched for the current environment and all the chronic conditions we’re seeing are as a result of living in a world for which our bodies were not prepared for. Diana: Bryan, I never leave a conversation with you without having a gazillion more questions about what you just shared. How can our readers who are interested in shaping their future contact you? Bryan: I have shopped at Dorignac’s for years growing up in New Orleans. I love Dorignac’s and I think it’s a fantastic public health endeavor on their part to expand the message of “food as medicine” with options for their customers. Anyone can contact me via email, visit my website or stop in at my Facebook page. Many thanks to Bryan Agurcia for taking time out of his busy schedule to do the “q&a” with me. It’s my hope that our conversation was helpful and enlightening as you navigate ways to improve what you know, what you eat and, ultimately, how you feel and age. Well, Diana, the hits just keep on coming! What a fabulous and interesting interview. Diana, I am definitely adding Bryan Agurcia’s thinking on aging and the “mismatch theory” regarding the time lag between our current genealogy and the current conditions of our environment. This NEEDS TO BE ON BILLBOARDS across the nation to help hit an environmental reset button whenever sensibly possible. Great reading. Earthing yeah baybeee. For indoor use, I have acquired a silver mat from Earthing.com called grounding silver plush pad to supplement my outside activities. And yes, we’ve been programmed to believe an outdated paradigm about aging. It’s “old programming” from our misguided suburban elders. Re boot and update your human operating systems! Now.